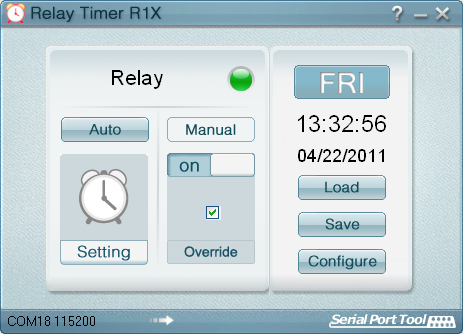 Relay Timer R1X is programmable timer software for setting timing features of the relay. Relay Timer R1X works with 1-channel relay controller boards of National Control Devices (NCD) . Relay can be turned on/off manually and automatically according to powerful schedule setting. Relay Timer R1X supports Com Port and Network connection between PC and relay board. The connection status is detected and shown continuously. Programmable timer for setting timing features of 1-channel relay boards. The current status of relay is updated and displayed simultaneously. Relay Timer R1X supports remote access. Relay Timer R1X can be shown on status bar when the program is minimized. Relay Timer R1X can be set to run automatically after login Windows. Relay Timer R1X can also be launched by command line with specified configuration file or schedule setting file. * Control 1-channel relay boards and auto start after logging in Windows. * Relay Timer R1X support Network and Com Port connection between PC and relay board. * Detect connection status between PC and relay board continuously. * Remind after disconnection and recover after reconnection automatically. * Turn on/off relay manually and automatically according to schedule setting. * Relay Timer R1X support multiple schedule setting and powerful setting with recurrence options. Qweas is providing links to Relay Timer R1X 2.4.0.1084 as a courtesy, and makes no representations regarding Relay Timer R1X or any other applications or any information related thereto. Any questions, complaints or claims regarding this application Relay Timer R1X 2.4.0.1084 must be directed to the appropriate software vendor. You may click the publisher link of Relay Timer R1X on the top of this page to get more details about the vendor.